Myles Smith and Gretchen Bennett in costume. Unity is a strength in the Pearl River High community, even when it comes to theater. 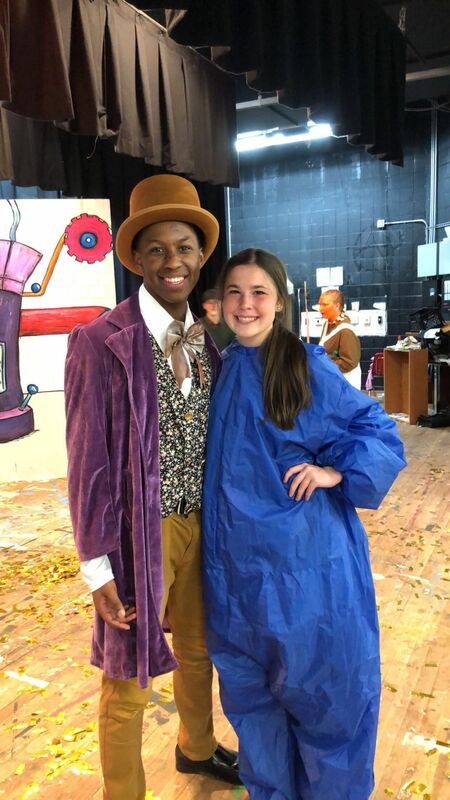 After the talented theater’s first semester performance of "School House Rock," theater teacher Laurie Jo Koster selected "Willy Wonka Jr." for the second semester musical. The cast and crew of 41 put on matinees for Pearl River High’s feeder schools, including Little Pearl, Sixth Ward and Riverside elementary schools. There were also two evening performances for family and friends to witness the magical chocolate factory. Many departments at the school worked together to make the play a success. Pearl High School’s welding and wood shop classes built the props under direction from Joshua Martin. Among the impressive sets were the Wonka gates that guests walked through to enter the cafeteria. The gates were black, metal, functional gates that were larger than life, with Wonka hats carved into them. To tie it all together, the big Wonka "W" was painted gold. The gates brought the set to life and brought the audience into the fantasy. Art teacher Renee Pando painted the set for this performance, including all of the flats and props that made Wonka’s factory seem real. She used neon paints that glow under black lights, vivid colors and freehanded the whole set by herself. Additionally, Sarah Stroyewski's desktop publishing classes designed the programs. Koster asked faculty members Elizabeth Lee, Melanie Saladino, Becky Crain and Kay Wells to review the practice runs, which strengthened each performance. Another huge help to the show’s success was the custodial staff that set up and took down all the chairs for matinees, not to mention cleaning up all the confetti used in the shows. Lastly, Clear Moore’s TV broadcasting class recorded the evening performances so the cast can keep their high school performance memories. The show was a big commitment, but was lot of fun. Tyler Mckenzie, one of eight seniors in the musical, played Grandpa Joe.